In conjunction with the country's 50th Merdeka Celebration, 50 things have been chosen as a national heritage that all the peoples of Malaysia should be aware. The 50 things consists of 18 buildings, 20 objects and 12 cultural practices. The buildings listed include the Parliament House, Sultan Abdul Samad Building and the National Mosque. The objects include the national flag, the hibiscus flower and The Royal Long Keris. The cultural practices include the lion dance, the Malay Joget and Ngajat. 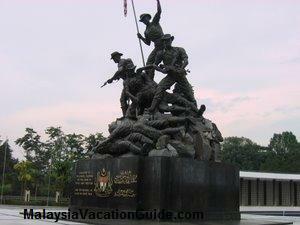 These national heritage were chosen by the Ministry of Culture, Arts and Heritage of Malaysia. With this, Malaysia now joins countries such as Britain, USA, Germany, France and Australia in having legislation to protect their heritage. 1. Parliament House - Members of Parliament who were elected by the people meet here. 3. Flagpost - The Flagpost at Dataran Merdeka where the Malaya flag was raised for the first time. 4. Sultan Abdul Samad Building- The Moorish architecture historical building built in 1897. 6. Kuala Lumpur train station building - The Moorish architecture building. 7. Keretapi Tanah Melayu headquarters building - The Moorish architecture building built in 1910. 16. The National Monument- Built to remember soldiers who gave their lives in defending the country. 17. Kinabalu National Park, Sabah- The park at the foothill of Mount Kinalabu, the highest mountain in South East Asia. 18. Mulu National Park, Sarawak- A world heritage site with world's largest cave chamber.